The closest Hotel to the event is the Austin Midtown Holiday. Check out the program schedule and see who is speaking! Register! We have been following DevOps for many years and it always seems to portend much awesomeness in the future. Who wouldn't want to deliver more software more often? Sadly, based on how little we, as analysts, see DevOps in practice, it still seems like something of a unicorn. Interestingly, this has been changing rapidly. This presentation will present 451's freshest analysis of where the DevOps market is in maturity, including a DevOps practitioner survey (based on 200 DevOps and DevOps-minded folks), early market-sizing, a landscape overview and quantitative market studies - along with plenty of silly, but nonetheless helpful qualitative hand-waving. Our gut instinct is that DevOps is following a pattern very similar to Agile Development and open source, which are two cycles we can use to think about DevOps. There are some early best practices andÂ cases to go over, but very few - part of what we hope to suss out with this talk are more stories from the field. Our early studies show that there's much room for improvement, but a nice zeal for doing the actual work. The unicorn seems close to sprouting wings. Humans are deeply tribal, ignore this at your peril. We inevitably create narratives about ourselves and each other that define our identities. The narratives can also impose our limitations. Don't be devops, don't even do devops, be awesome. You pour blood, sweat and tears into your API, open source and weekend projects - let's make sure they get the attention they deserve! We'll go through real-world examples of tactics developers can do to attract attention to their work. Beyond growth hacking and that first post to Hacker News, we'll look at high-value marketing maneuvers that will drive usage, but won't make you feel like a dirty huckster. ITIL isn’t evil, most people who implement ITIL don’t execute on the Continuos Improvement process. DevOps and ITIL (and ITSM) actually work together very well. In this talk will with highlight the change management and continuous improvement process area’s in ITIL and how they can be implemented using DevOps tools and methodologies. At PagerDuty, we are building out our highly available service for alerting the right person when s%IT breaks, but how does PagerDuty monitor PagerDuty? In this talk we will cover the strategies that PagerDuty uses to always make sure our service is always up and running. Leverage Chef and AWS provide a global, scalable infrastructure that includes auto-scaled web workers, a centralized queue and auto-scaled back-end processors that can also be hooked up to a variety of data stores. It also includes networking and supporting infrastructure like NAT, VPN, Monitoring/Alerting/Log Aggregation and custom scaling metrics for AWS. Helping customers evaluate their ability to deploy and operate systems while managing incidents is key to Chef's Consulting practice. We have developed an operations maturity model that provides a roadmap for understanding and improving mean time to production while setting realistic expectations, this session will explain the challenges and thresholds for building more effective organizations. Your site has just gone big. Depending on how thorough you’ve been with load testing, you may or may not be celebrating this impending flood of user traffic. This talk will elaborate on the topic of load testing, which often receives limited coverage among performance and scaling discussions. I'll define what a load testing strategy should look like and elaborate on several of its components. Using Docker to allow testing of any version of your API at will -- environments for everyone. Service discovery must be hard, from ye olde SRV records and UDDI to hip new etcd and serf, we keep inventing new ways to help robots talk to each other. But instead of trying to pick a winner, I wrote discoteq to let applications work with whatever's clever. Is your organization considering Chef, or are you someone who has tried using Chef with little success? One newbie learning Chef found that it doesn’t have to be as hard as it seems. Best Practices for using Docker to help increase Web developer productivity and operations. A detailed reference architecture that aids developers to test code quickly while minimizing bugs. A brief introduction to Sails.js, a realtime, server-side MVC framework for Node.js. I’ll point out some of the problems that Node.js developers face when trying to build apps from scratch, and show how Sails helps solve them. Dashboards that measure things like code commits, performance data and test failures are a necessary ingredient for any Ops or Dev team. In this session we will build a StatsD / Graphite server. We will send data into StatsD and shape graphs using Graphite functions. Once you see how easy it is to get data into Graphite, a whole realm of metrics will open up for you. Team members get tried of carrying around the weight of member negativity, process waste, and growing technical baggage. It's time to stop tracking velocity and start tracking happiness. WP Engine is building it's newest feature as we speak: the ability for all 15,000 customers to have shell like access to their system. We already allow customers to run almost any code they'd like within WordPress, but command line access is another massive risk altogether. I'll discuss the system design as well as how we're keeping this locked down and secure while still being flexible and fast. Configuring servers has evolved from the bearded Unix admin to wikis to configuration management tools which is where many people are today. This has resulted in machines that can be repeatedly reproduced from code and are often managed as code. This lightning talk will quickly show the evolution of configuring servers and identify the ephemeral, immutable machines as an ideal we should be striving to achieve. 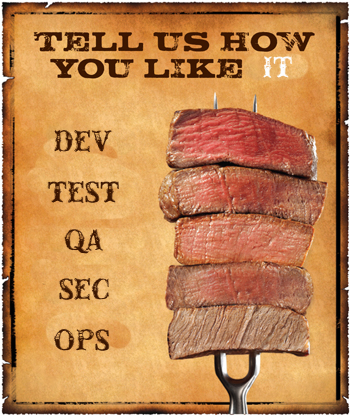 Moving to DevOps? Come to this session and learn why it is all about culture -> insights from an immigrant's journey in two nations and 10 companies. Quick sample of toolchains used with openstack. How do continuous integration and continuous delivery connect with each other? If I'm doing continuous integration, does it mean I'm almost doing continuous delivery? In this talk, we're going to talk about how to keep devops weird and local in Austin, Texas. Why names like "prod-frontend-web-2" are bad for your Chef nodes and a look at an alternative. Sell DevOps the collaborative way, not the hard way. How to devlop & use collaborative leadership skills to build devops culture from the ground up. Common complaints against open source project documentation is that it's insufficient, incorrect, non-existent, hard to find, and difficult to update. There's no silver bullet but one of my favourite tactics is lowering the barriers for absolutely anyone to contribute documentation. Conway's Law is used to describe the Frankenapps that result when different parts of an organization create different parts of a product. The striation of dev, QA, and ops teams also provokes Conway's Law, creating a "Human Centipede" where teams pass their product downstream to other teams, and it's just as harmful. Can you beat Conway's Law, and if so, how? This presentation is an overview of Ansible Inventories and the power behind them. It briefly covers using Zabbix auto registration to segregate hosts in to key groups. How do we succeed in a world that is constantly changing? Here are 9 principles for adapting to change, managing risk and fostering an evolutionary culture of improvement. I am a builder of culture, I run a service organization. The people I hire focus on making it better across the entire business. We identify silos and build paths between them. Then we tear them down. I don't direct a silo of specialists, I direct the implementation of a philosophy and culture. Do you?